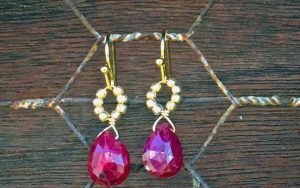 We love to make jewelry gifts for Christmas! 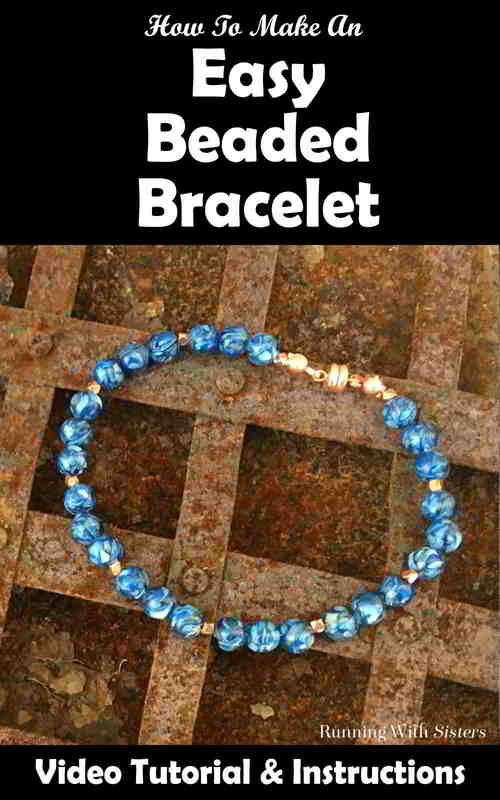 So we are delighted to share this Easy Beaded Bracelet. 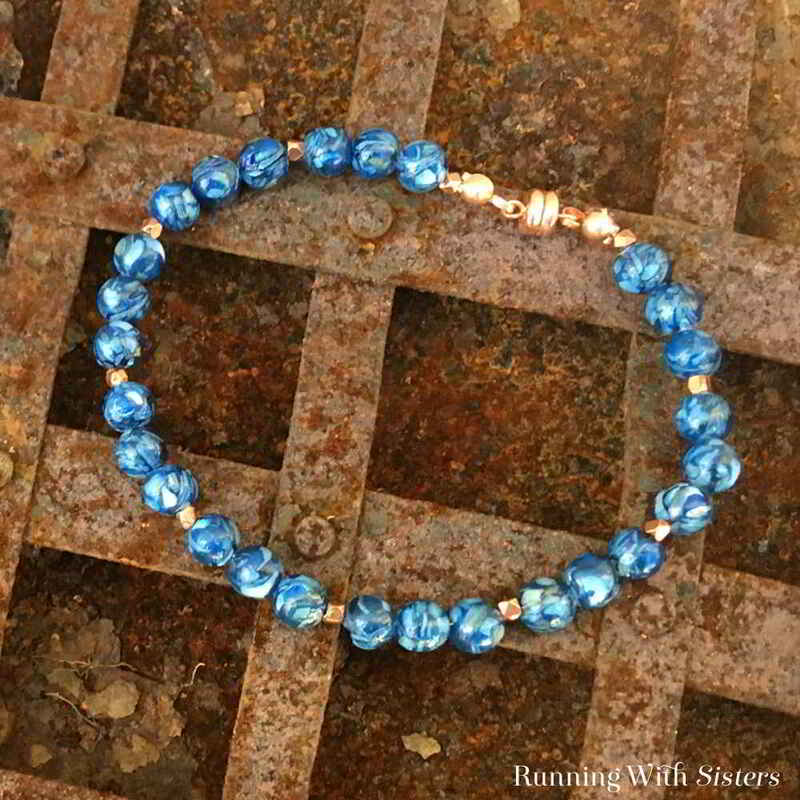 We made this one with pretty ultramarine blue beads and copper nuggets, but you can make this gifty piece of jewelry with any beads. 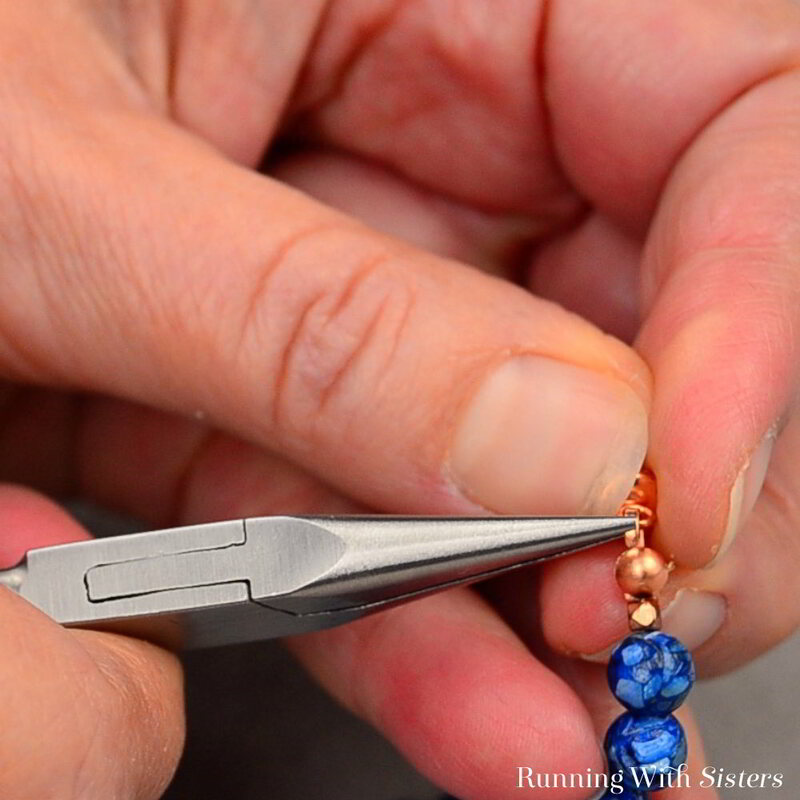 Here’s a complete video tutorial we made showing how to make this Easy Beaded Bracelet. Follow along then use the steps below to make your own! 1. 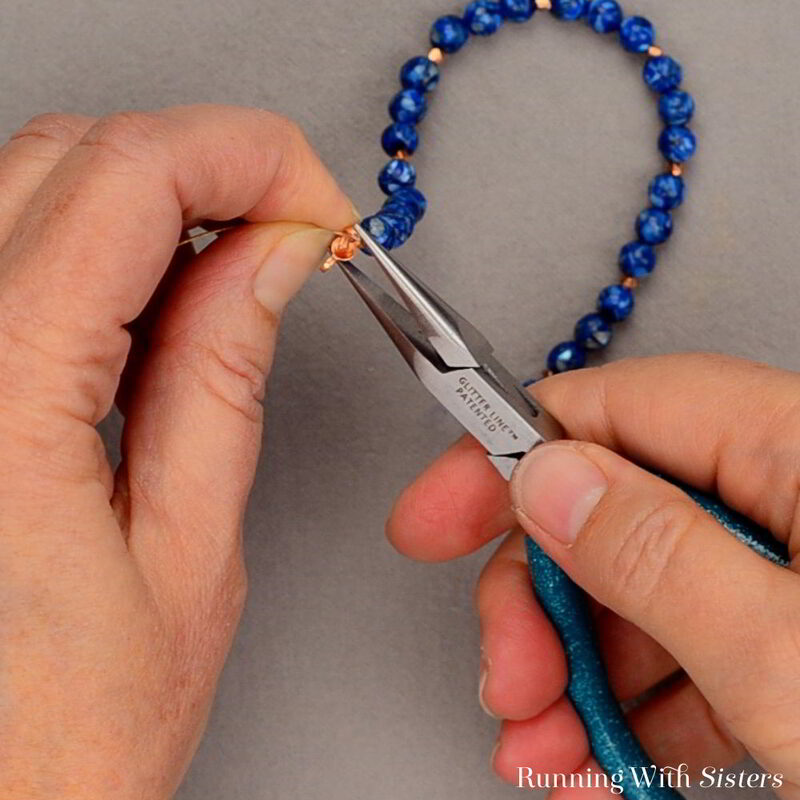 To get started, cut a piece of bead stringing wire 8.5″ long. This will make a bracelet about 7.5″ to 8″ long. 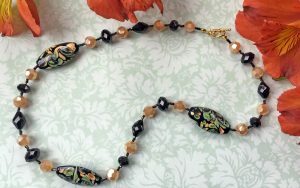 You can adjust the bracelet length by adding or subtracting beads. We like to take a bracelet we already wear and love and measure it to find the right size. 2. Slide a clamshell bead tip onto the end of the wire. 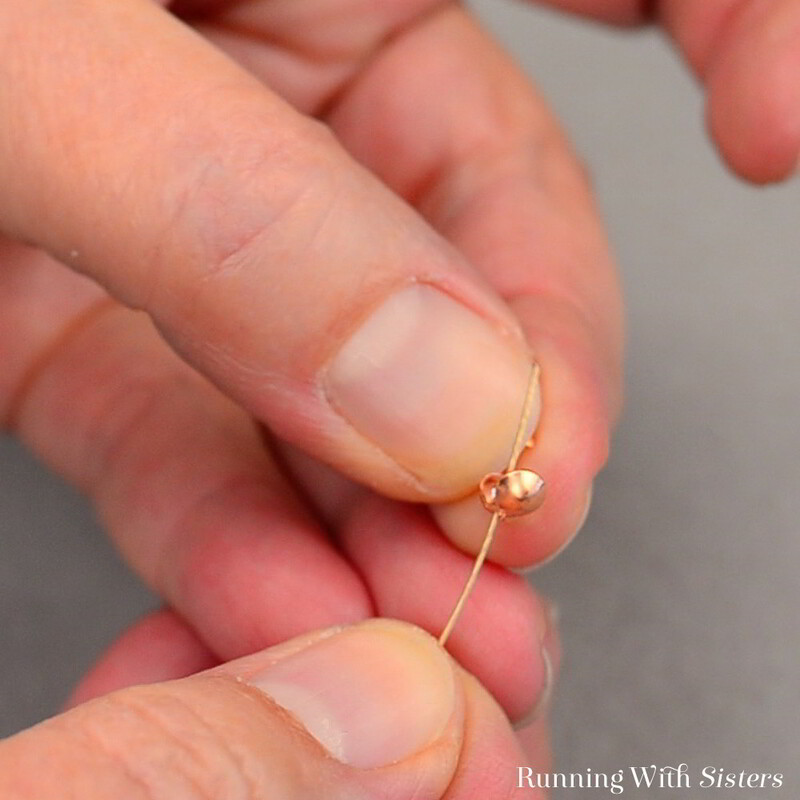 Then slide a crimp bead onto the wire. 3. 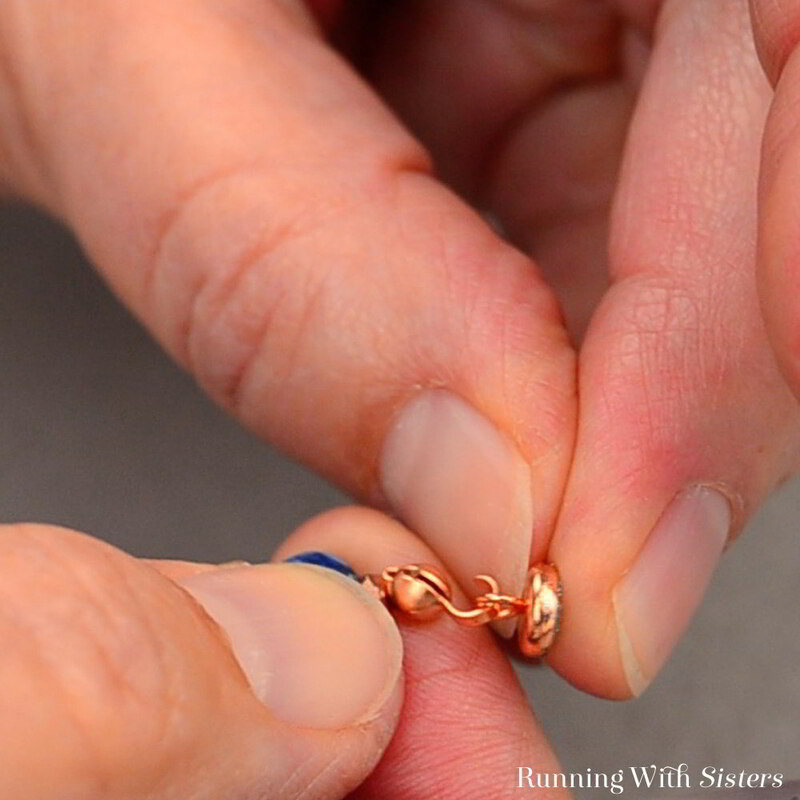 Use the chain-nose pliers to crimp the bead onto the wire near the end of the wire. 4. Slide the clamshell up and over the crimped crimp bead. You can place a drop of jeweler’s glue inside the clamshell for added security if you like. Then gently press it closed with the chain-nose pliers. Trim the tail of the wire with the wire cutters. 5. 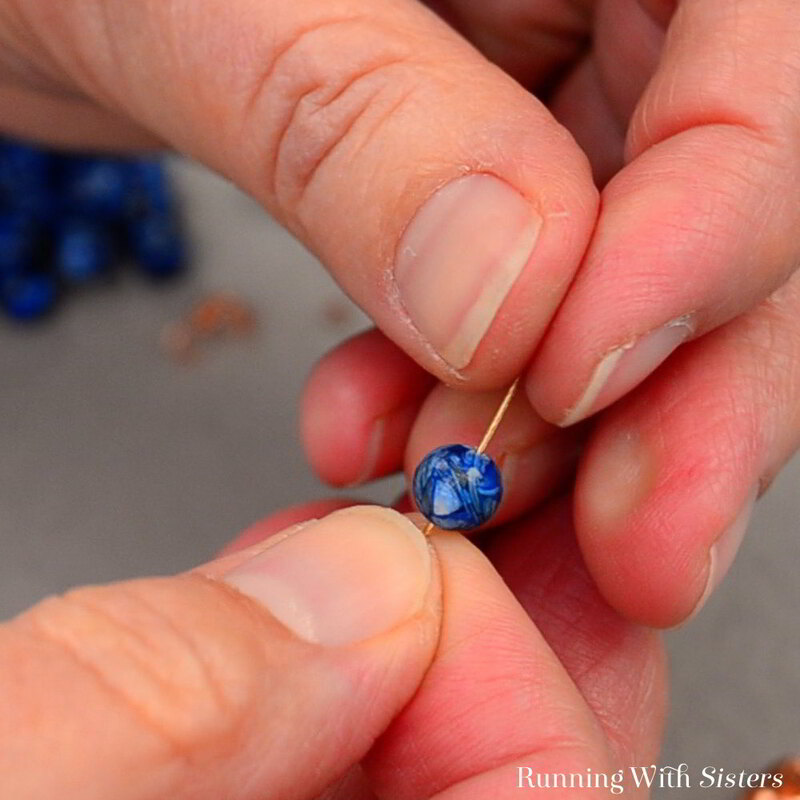 Slide one side of the clasp into the loop of the clamshell bead tip. 6. Use the pliers to close the loop. You can use a clamshell bead tip with a soldered closed loop if you like. Just attach the clasp with a jump ring. 7. 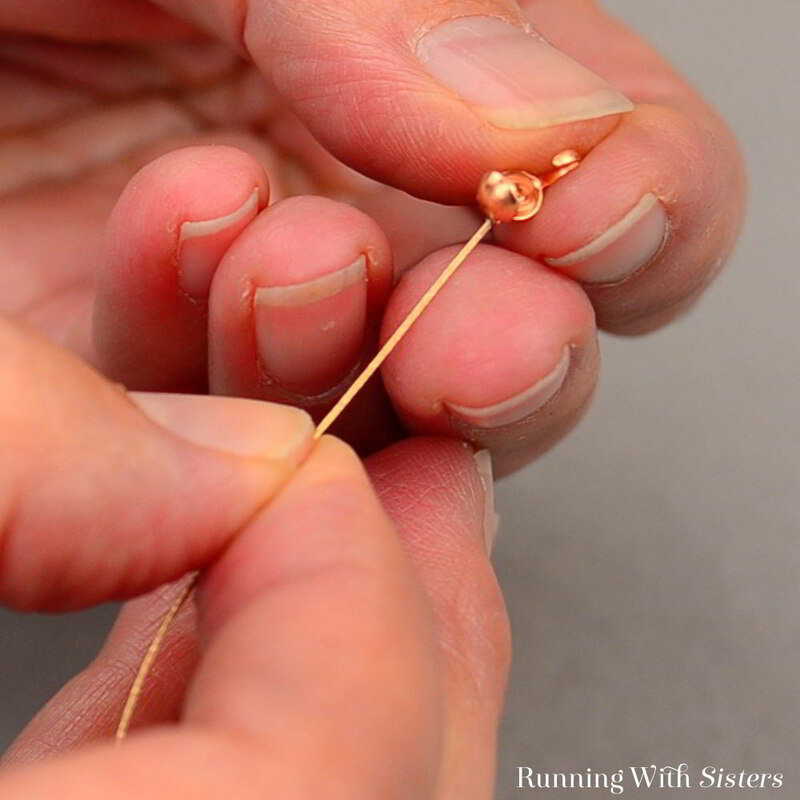 Start beading by sliding a copper nugget onto the bead stringing wire. 8. Next feed three blue beads onto the wire. Repeat the pattern of 1 copper nugget, 3 blue beads, 1 copper nugget until you have all the beads on the wire. 9. 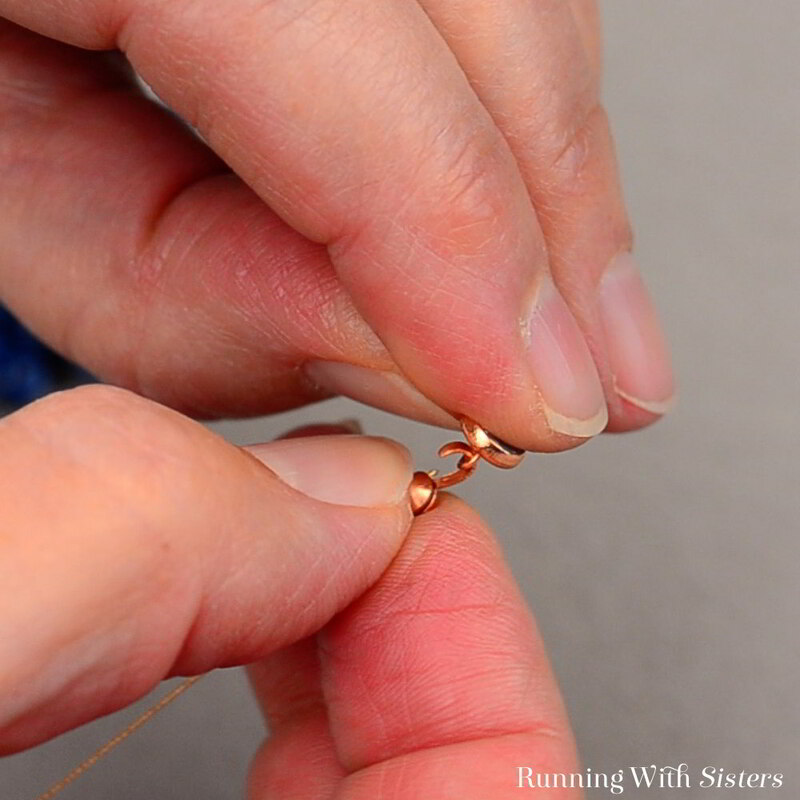 To finish the end, slide a clamshell bead tip onto the wire followed by a crimp bead. 10. 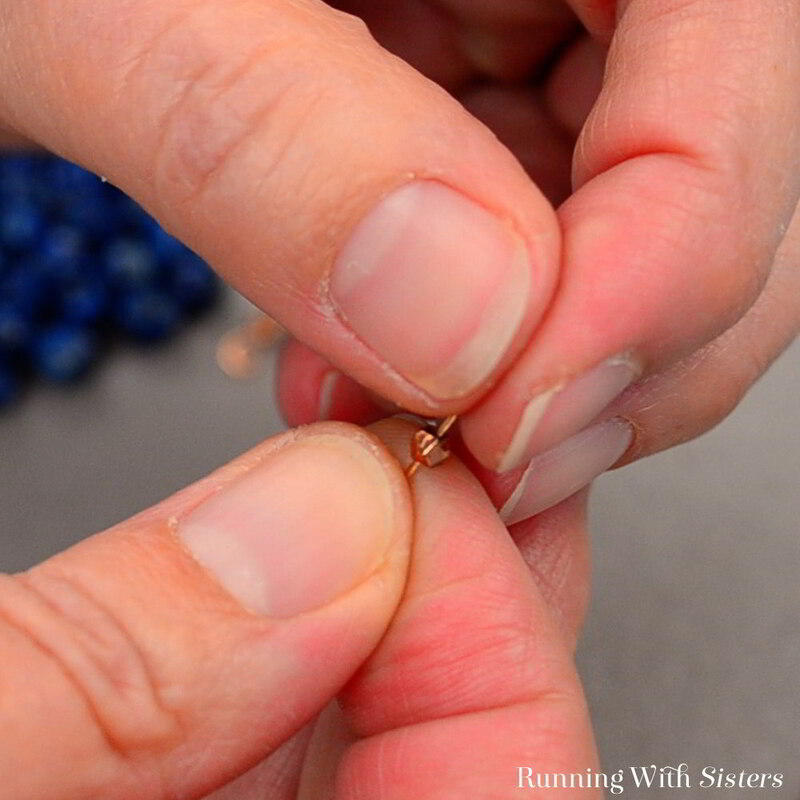 Push the beads together and slide the clamshell and crimp bead down to the beads. 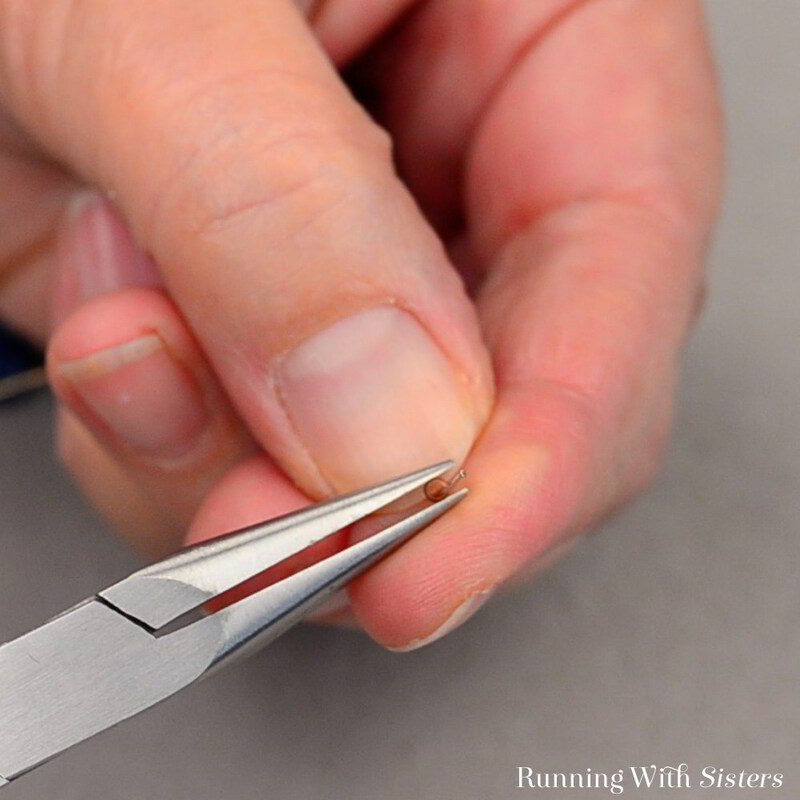 Then reach the tip of the chain-nose pliers into the clamshell and press the crimp bead onto the wire. 11. Next close the clamshell over the crimped bead. 12. 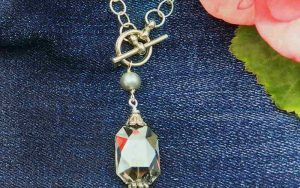 Feed the other side of the clasp into the loop on the clamshell bead tip. 13. Close the loop on the clamshell. 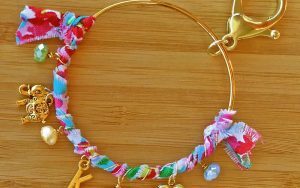 This pretty bracelet makes a terrific gift. Who wouldn’t want a handmade piece of jewelery?! 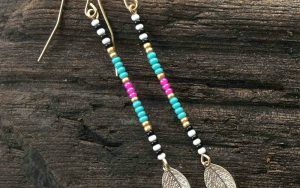 Do you make jewelry as gifts? Tell us what you like to make. We’d love to hear from you! We love it when you pin our pics!